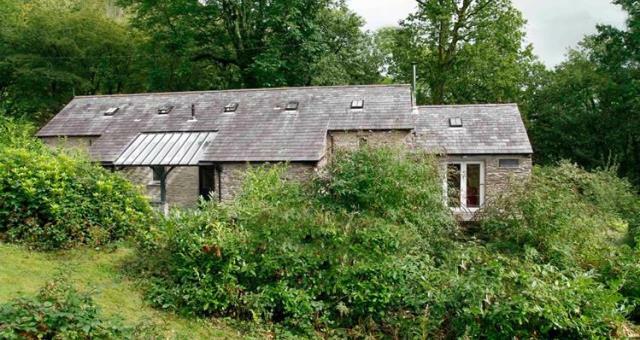 Yr Hen Stablau01654 702218work Self-cateringYr Hen Stablau is a recently renovated 1840s stables set in luxuriant gardens on a wooded hillside overlooking the Dyfi Valley near Machynlleth. This peaceful, secluded and picturesque setting makes Yr Hen Stablau ideal if you want to relax, paint, read or write. It is also an excellent base for a more active holiday: walking, cycling, golf, swimming, birdwatching are all available nearby. Climate change offer: 10% discount when arriving by train, minimum 3 nights stay. Tickets must be shown on arrival. Yr Hen Stablau is a recently renovated 1840s stables set in luxuriant gardens on a wooded hillside overlooking the Dyfi Valley near Machynlleth. This peaceful, secluded and picturesque setting makes Yr Hen Stablau ideal if you want to relax, paint, read or write. It is also an excellent base for a more active holiday: walking, cycling, golf, swimming, birdwatching are all available nearby. Sleeps 6 in 3 bedrooms. Wheelchair access all ground floor including double/twin bedroom and shower room. Machynlleth town 1 mile. Coast 8 miles. Pets welcome. Free Wifi Available Children welcome from any age. Trains two-hourly to Machynlleth from London Euston (4-5 hrs) via Birmingham (2 hrs) and Shrewsbury, or London Paddington via Reading. Buses from Shrewsbury, Wrecsam. 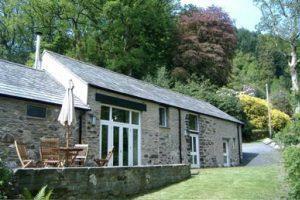 Yr Hen Stablau is 1 mile from train and bus and transport can be provided on arrival. A 493 between Machynlleth and Aberdyfi and less than a mile from Dyfi Bridge. The drive up to Yr Hen Stablau leads to the front porch with a level way in to the lobby. The whole of the ground floor of Yr Hen Stablau is wheelchair accessible, and the doors are all 900mm wide or wider. On the ground floor is a double bedroom, shower room and toilet, sitting room, kitchen/dining room, hall and access to the terraces front and back. The shower room has roll-in shower, WC, grab rails and lever taps. Mobile hoist available. All door handles are disability friendly, the basins and kitchen sink have lever taps, and the colour scheme is planned for good visibility of doors, windows, handles, floors, worktops and cupboards. The cottage is light with plenty of windows, skylights and lights inside and out. There is a radio, CD player and satellite digital TV with teletext., free wifi We can arrange free transport on arrival from the railway and bus stations in Machynlleth and also help carrying luggage on request.